(i) When the Flag is used to cover a casket, it should be so placed that the union is at the head and over the left shoulder. The Flag should not be lowered into the grave or allowed to touch the ground. Section 2 and Executive Order 10834. (a) It is the custom to display the Flag from sunrise to sunset, however, the Flag may be displayed twenty-four hours a day if properly illuminated during the hours of darkness. 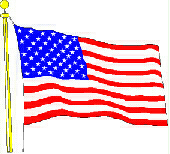 (b) The Flag should not be displayed during inclement weather, unless it is an all-weather flag. (c) The Flag should not be draped over the hood, top, sides, or back of a vehicle or of a boat. When the Flag is displayed on a car, the staff shall be fixed firmly to the chassis or clamped to the right fender. (d) The Flag should be at the center and at the highest point of the group when a number of flags of States or localities or pennants of societies are grouped and displayed from staffs. (f) The Flag, when flown at half-staff, should be hoisted to the peak for an instant and then lowered to the half-staff position. The Flag again should be raised to the peak before it is lowered for the day. (g) On Memorial Day the Flag should be displayed at half-staff until noon only, then raised to the top of the staff. (h) By order of the President, the Flag shall be flown at half-staff upon the death of principal figures of the United States Government and other dignitaries as a mark of respect to their memory. anything beneath it, such as the ground, the floor, water, or merchandise. (k) The Flag should never be used as wearing apparel, bedding, or drapery. (l) The Flag should never be used for advertising purposes. It should not be embroidered on such articles as cushions or handkerchiefs and the like, printed or otherwise impressed on paper napkins or boxes or anything that is disposable. (m) No part of the Flag should ever be used as a costume or athletic uniform. However, a Flag patch may be affixed to the uniform of military personnel, firemen, policemen, and members of patriotic organizations. The lapel Flag pin should be worn on the left lapel near the heart. (n) The Flag, when it is in such condition that it is no longer a fitting emblem for display, should be destroyed in a dignified way, preferably by burning. (o) During the ceremony of hoisting or lowering the Flag or when the Flag is passing in a parade or in review, all persons present except those in uniform should face the Flag and stand at attention with the right hand over the heart. Those present in uniform should render the military salute. (p) During the rendition of the national anthem when the Flag is displayed, all present except those in uniform should stand at attention facing the Flag with the right hand over the heart. Persons in uniform should render the military salute at the first note of the anthem and retain this position until the last note. When the Flag is not displayed, those present should face toward the music and act in the same manner they would if the Flag were displayed there.